Now, it's a flourishing church thanks to one remarkable man. 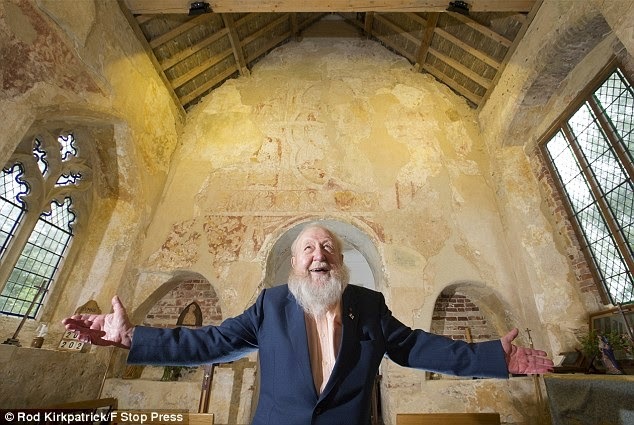 Bob Davey, 85, has forked out thousands of pounds of his own cash and even fought off Satanic worshippers in his bid to restore the ninth century Anglo-Saxon church in Swaffham, Norfolk. 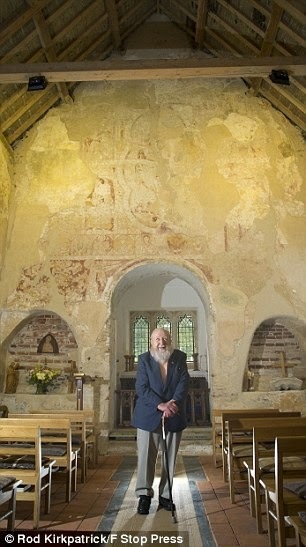 In doing so, he uncovered rare and valuable historical wall paintings that he says have international status. Bob is now a warden at St Mary's Church, which welcomes visitors from across the world and has even received Prince Charles and Princess Margaret. The building was discovered by Bob's late wife Gloria one morning in June 1992 while she was on a ramble with friends. Hidden in woodland at the top of a small hill, stood a tower shrouded in dark ivy. Gloria managed to force her way in, through piles of rubbish, and found a disturbing scene. Soon realising it was an old church, Gloria found it laid out as a Satanic temple with a pagan alter and anti-Christian symbols. "This annoyed me intensely," Bob recalled. "I've been a Christian all my life and wasn't putting up with this on my patch. "That very afternoon, I cleared all their rubbish out and burnt what I could." According to Bob, the church had no roof, floor, or windows, while trees threatened the structure. The main door and a number of stones from the walls had also been stolen. 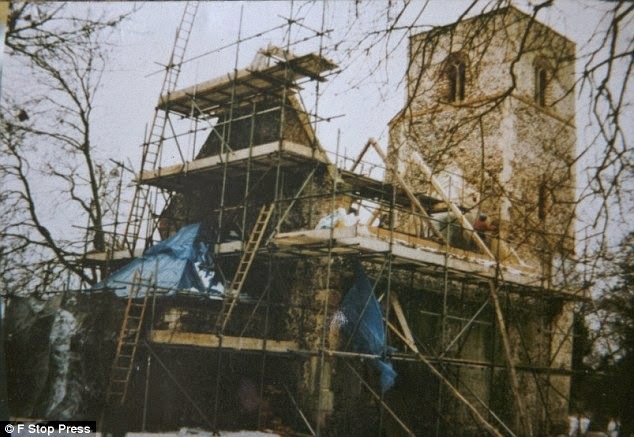 "It was still consecrated so I was able to start services again straight away - even without the roof on," said Bob. But he was forced to guard the building at night from black-clad Satan-worshippers who were still trying to use it. Bob claims the devil-worshippers tried to run him down with a car and on another occasion came to his house and threatened him with his life if he carried on his work. Help came from the Territorial Army who sent soldiers to stand guard with Bob. With no prior knowledge of restoration, Bob began his formidable task by cutting the roots on the thick ivy covering the building before removing it. As he was repairing a crack in the wall, he made another astonishing discovery. Behind the plaster, were some wall paintings dating back to the Norman Conquest or even earlier. "The paintings are unique and very valuable," said Bob. "Only experts can continue to uncover the paintings. "We've probably only revealed a third of what's there." As a result, English Heritage granted the building a grade one listed status. Among the sacrifices Bob has made, is the sale of his small antiques business to fund the restoration. He has also received Heritage Lottery Funding and thousands of pounds in donations from visitors who travel from around the world to visit the church. Now supported in his efforts by a team of volunteers, Bob says an estimated £300,000 has been spent on the project, including several thousand pounds of his own cash. Bob, who received an MBE from the Queen for his efforts in 2005, is currently raising money for the next round of restoration, which he said needs £50,000. He said: "It was a roofless ruin in a dreadful state that was about to be pulled down. "Now, it's a working church again and an attractive visitors' site. "It's a co-incidence that brought me here, but I've taken it on and made something of it. "It's been well worth it." Bob added: "If you want to retire and want something to take on, take on a ruined church. You will never look back." Last used regularly in the 1930s, St Mary's church had been forgotten about after buildings in the village it stood were abandoned and demolished. But it remained a consecrated building and could not be torn down.